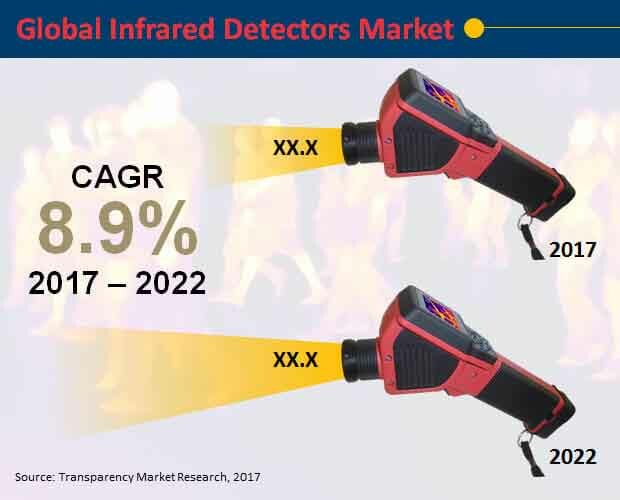 A recent report published by Transparency Market Research (TMR) reveals that the global infrared detectors market is set to soar at a CAGR of 8.9% during the forecast period (2017-2022). Increasing use of infrared detectors in industrial and manufacturing applications is likely to boost the global demand for infrared detectors during the forecast period. At the same time, infrared detectors are gaining momentum as a highly significant security apparatus. Moreover, advancements in IR detection technology is driving the adoption of IR detectors in various industrial applications. There are basically two types of technology used in IR detectors - uncooled and cooled. Uncooled infrared detectors are smaller in size and are have relatively lower complexity as compared to cooled IR detectors. Due to their exponential night sighting capabilities, infrared detectors are being increasingly incorporated in night vision cameras.